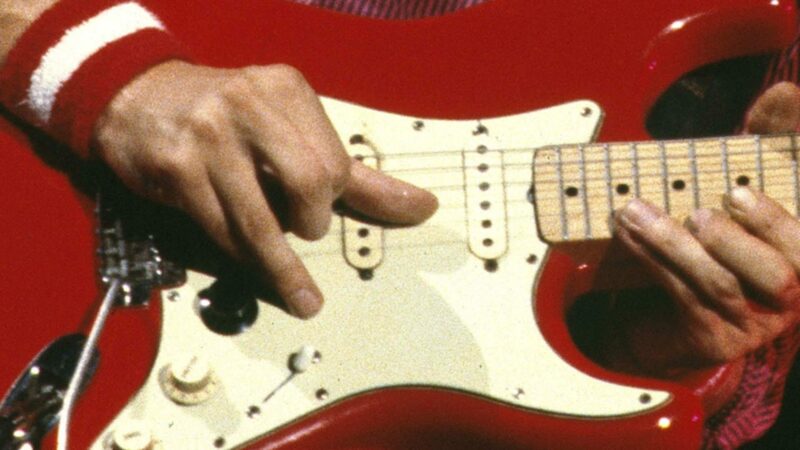 ⟵What tuning is Setting me up by Dire Straits, and what guitar? Ingo, great article. I knew most of this, but the substitution of a major chord where a minor one would normally be was a bit of an “ah ha” moment for me. I’ve seen this in many songs, but it never dawned on me that there as a “formula” to it. John, nice to see you liked the article. Love your explanation!!! Please let me read more!!!!!!!! Great information.Learning guitar chords are one of the first steps to great guitar playing. We will be surprised how many different songs we will be able to play just by mastering a few simple guitar chords. By learning the G, C, D, A and E chords we will be able to play a lot of popular music. Learning guitar chords are one of the secrets to playing real music. Hey guitar dude, thanks a bunch i never had it explain to me like that before and now i get it. i really apprecite how well that was explain and so easy to understand. Do you have any site which i can go to where it teaches someone learning lead guitlikes that knows all scales but when i try to play lead it sounds like i am just playing scales and i feel stuck in the box . is it that i just dont have the lead mentality or what . friends think i am good but they dont know i am playing scales all over the neck but i know the truth and i feel stuck can you help or show me a video that will break this boxy lead i have. Great explanation! I’ve seen the circle before, but never with a description on how to put it to use. I’m new to your site, keep up the good work! P.S. I’m in Canada and I play an early 80’s Tokai(with new Fender pu’s) through an early 1980 Hiwatt Custom 50, so I’m rockin’ all over the world! hey..thanks a tonne..this is great! great job! 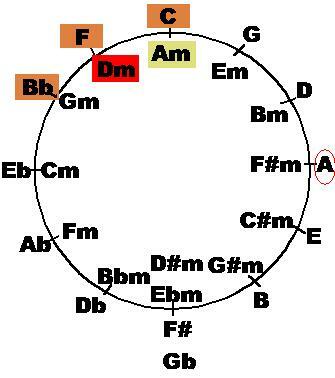 I´m working on this circle, it´s very useful to understand musical theory, I´ve seen it before but I cannot understand a thing, with your great explanation now I´m able to learn it. Just to let you know that you have cleared up my confusion in minutes that I have been truing to understand for days. Very cool stuff. I love simple truths like this, and really feel like I took another mini-leap forward. 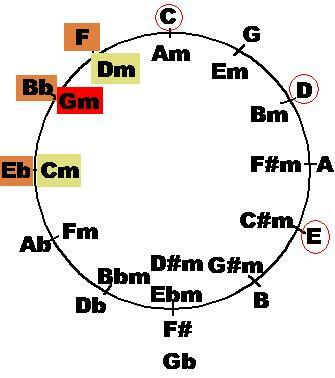 I also realized that Google Images is an awesome place to search for guitar chord graphics! Hi, Ingo! You explained it perfectly, I think. 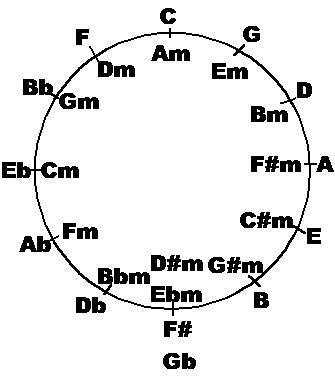 I’ve had some trouble getting into the whole circle of fifths concept (I only learned it about six months ago), but your explanation helped a lot. I have played the piano for almost seven years now, and I recently started learning the guitar – acoustic, at the moment, but I’m hoping that electric will come soon too – and I stumbled upon your site while searching for some MK guitar stuff on Google (big fan of his). where do 7th chords come in this? do you just substitute a major chord for a major 7th and minor chords for minor 7ths? 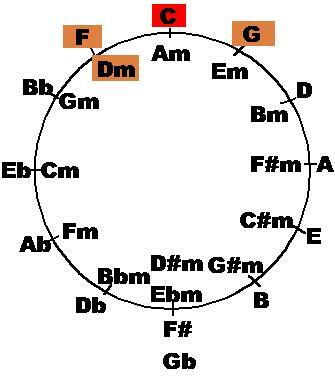 Often the seventh chord is used as the dominat chord (the right-hand neighbour in the circle), like e.g. C – F – G7 for the key of C, but with rock or pop music I found it is more like you suggested, they are used when their sound fits in. This is fantastic explanation. You simply put everything into one chart which explains entire logic very clear. Thanks!